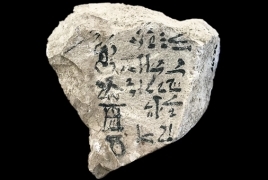 PanARMENIAN.Net - The earliest example of thealphabet — a possible mnemonic phrase that helped someone remember "ABCD" — has been discovered on a 3,400-year-old inscribed piece of pottery from ancient Egypt, a scholar believes, according to Live Science. Thomas Schneider, a professor of Egyptology and Near Eastern Studies at the University of British Columbia, reported the discovery in a paper published recently in the Bulletin of the American Schools of Oriental Research. This discovery "would be the first historical attestation of 'our' alphabet sequence," he said. The alphabet that is used today is derived from that used by the Phoenicians, a civilization that flourished between roughly 3,500 and 2,300 years ago in the Eastern Mediterranean. They used what scholars call a Semitic language, a term that refers to a branch of languages that trace their origins to the Middle East, each sharing some similar words. The early forerunner to the modern alphabet was written in Semitic languages. Few texts that are written in Semitic languages date back 3,400 years or more, however.